Welcome Webelos to a new scouting year with Pack 27! This year you will be experiencing a new type of scouting journey. We will work together to earn our Webelos badge. These are the requirements for the Webelos Core (Required) Adventures which became effective on June 1, 2015. Help plan, support, or actively participate in a service of worship or reflection. Show reverence during the service. Review with your family or den members what you have learned about your duty to God. Describe and identify from photos any poisonous plants and dangerous animals or insects you might encounter on your hike. These are the requirements for the Webelos & Arrow of Light Elective Adventures which became effective on June 1, 2015. Explore properties of motion on a playground. Does the weight of a person affect how fast they slide down a slide or how fast a swing moves? Design a fair test to answer one of those questions. If you are a qualified swimmer, select a paddle of the proper size and paddle a canoe with an adult's supervision. Talk to someone who works with people who have disabilities. Ask what the person does and how he or she helps people with disabilities. Show you can live "off the grid" by minimizing your use of electricity for one week. Keep a log of what you did. Discuss with your den members how you adjusted to this lifestyle. Discuss what to do if you become lost in the woods. Tell what the letters "S-T-O-P" stand for. Tell what the universal emergency signal is. Describe three ways to signal for help. Demonstrate one of them. Describe what you can do you do to help rescuers find you. Make a list of four qualities you think a leader should have in an emergency and why they are important to have. Pick two of them and act them out for your den. Describe how each relates to a point of the Scout Law. Describe how working on this adventure gave you a better understanding of the Boy Scout motto. Pick one type of engineer. With the help of the Internet, your local library, or a local engineer you may know or locate, discover and record in your book three things that describe what that engineer does. 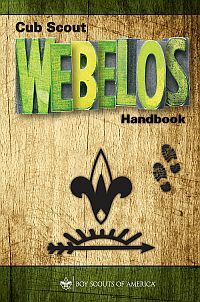 (Be sure to have your Webelos den leader, parent, or guardian's permission to use the Internet.) Share your findings with your Webelos den. Put a Fix It Tool Box together. Describe what each item in your toolbox can be used for. Show how to use three of the tools safely . Collect and care for an "insect, amphibian, or reptile zoo." You might have crickets, ants, grasshoppers, a lizard, or a toad. Study them for a while and then let them go. Share your experience with your Webelos den. With the help of an adult, inspect your home and its surroundings. Make a list of hazards or security problems that you find. Correct one problem that you found, and tell what you did.